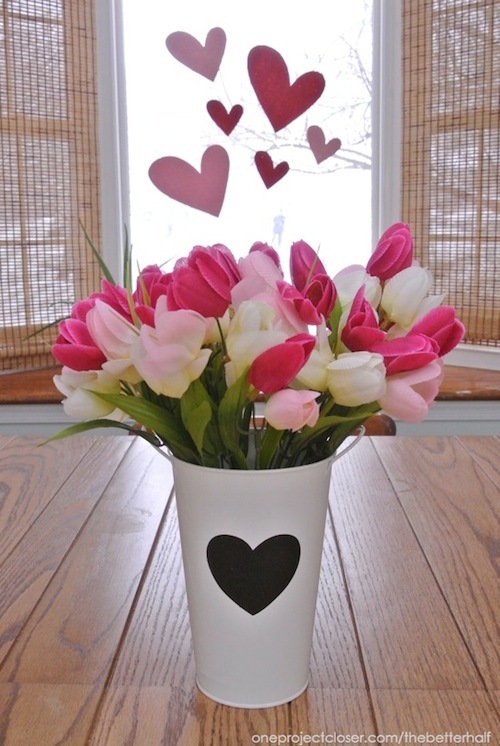 I have never gotten too much into decorating for Valentine’s Day, largely because my girls’ birthdays are on January 24th and February 11th. I’m usually so wrapped up in party planning and birthday decorating, Valentine’s Day is a bit much. But last year, Ethan and I cut some pallets and made some cheap art for the occasion. Check out our Pallets 101 video tutorial on how to cut pallets and assemble art. 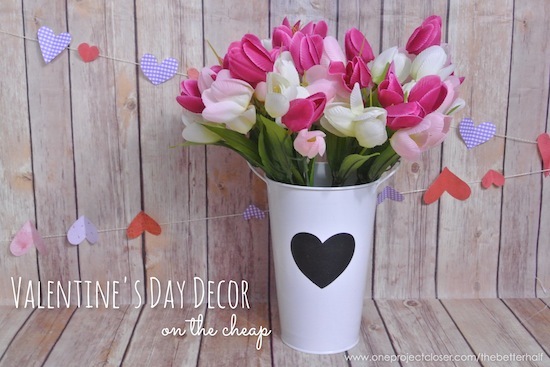 When planning out my pallets, I wasn’t really sure what I wanted to do, so I took to Pinterest, looking at cool subway-style art, printable, and other Valentine’s Day decor. 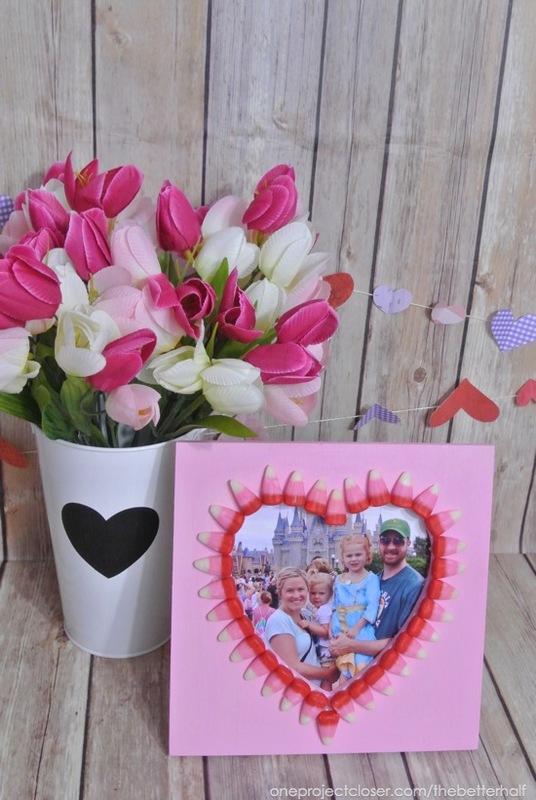 I ended up with two different Valentine’s printables from Lovely Little Snippets and Eye Candy Event Details. As usual, I used excess paint from previous house projects. One pallet I painted off-white, the color from our kitchen. And the other pallet I painted pale blue, the color from of living room. I then grabbed my no. 2 pencil, my acrylics, and a paint brush and watched some Fringe (our current addiction on Amazon Prime) while I started to work. As usual, I free-handed the design by looking at the inspirational picture, using a pencil first. 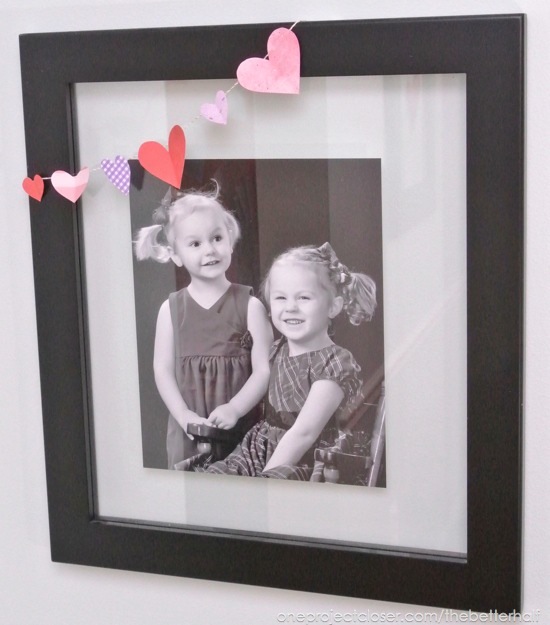 I am sure you could easily use a Silhouette Cameo or a printer and transfer paper if you aren’t a big fan of free-hand. I’m just too lazy and think its quickest to free-hand it. After that, I painted the words on both the pallets and let them dry. The next day, I lightly sanded them with coarse sand paper. Sometimes I over-sand, so I had to go back and touch up some spots with the acrylic paint. 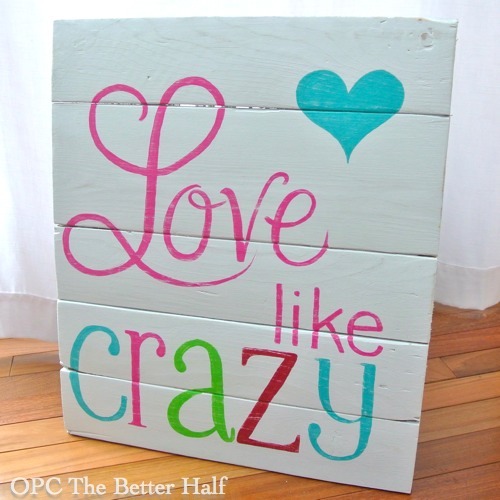 I love that pallet art is so quick, cheap, and EASY! yay for another pallet victory. I added a little paper and wire banner because it looked like there was too much white space. Turned out super cute, I think. Every month, me and the girls go to our local Senior Center to bring a little cheer and creativity. 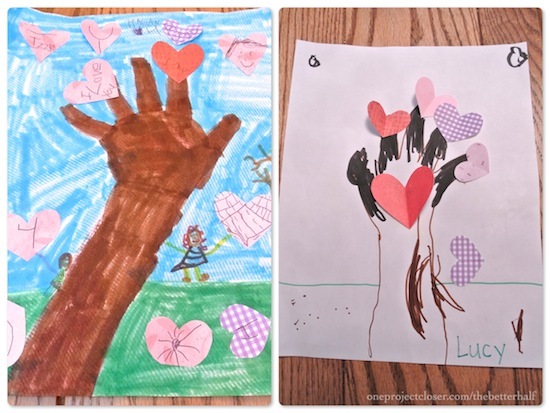 Last week, we made handprint trees with scrapbook hearts. It was super cute and both the kids and seniors had a great time. But afterwards, I was left with lots of lots of scrapbook hearts which I used to make bunting, along with baker’s twine. How cute is this picture of the girls? My dad from Chris Paulis Photography took it over the holiday and it is my new fave! In case you missed it last week, here were my crafts for the monthly craft night with Naptime Decorator! 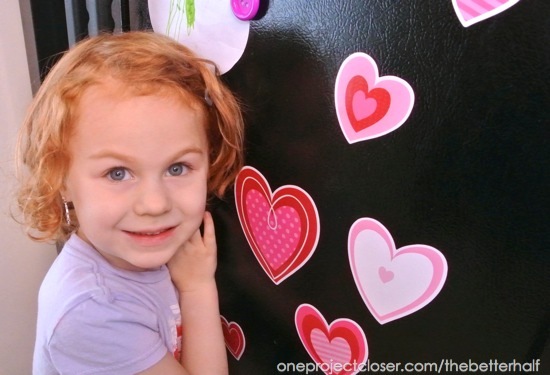 How cute are these glittery hearts and magnets from the Dollar Store?? Did you see this on Instagram? I got the container from the Target Dollar Spot and the tupils were left over from my wreath craft. What do you think? What should I do for my next pallet? Any pallet tips we should include in out tutorial in the coming weeks? I love these! My husband’s birthday is Valentines day so I used to always do some decorating and bake a heart shaped birthday cake. Now that we’re older and kids off at college there’s just a few decorations. Ahh that little bunting adds the perfect touch! LOVE!!! I love these Jocie! 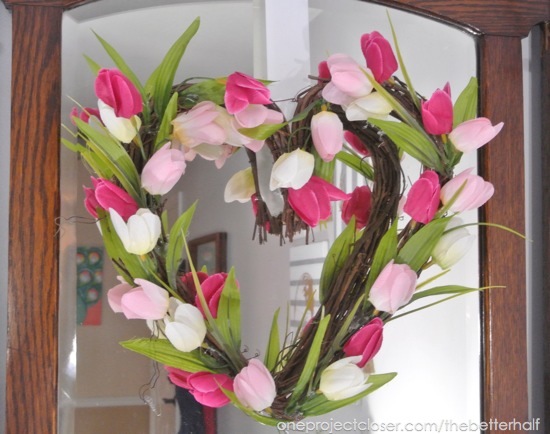 I was just toying with the idea of decorating for Valentine’s day. It usually just gets skipped because hubby’s birthday is the 13th! Poor timing on his Mother’s part! Haha! 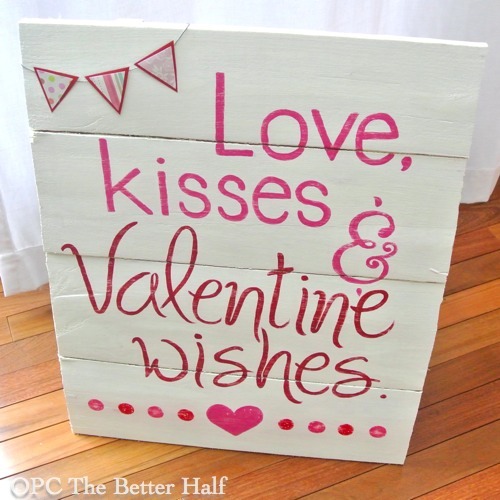 I’m so in love with pallet projects and cannot wait until your video tutorial. 🙂 I still owe you a picture of my first pallet project too. I like the one with the aqua color. They’re both cute. These are great! I can’t wait for the video tutorial. Thanks Paul and Aundrea! Just posted the video yesterday – hope you get a chance to watch! Those are adorable!! Love them! Thanks Michele and thanks for visiting! Love your pallets. So bright and cheerful! Visiting you from Hookin Up with HOH. 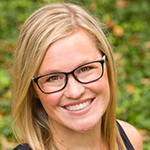 Hey Laurie! So glad you found us and thanks for visiting! Oh my goodness I love your pallets. They are gorgeous! Super cute. 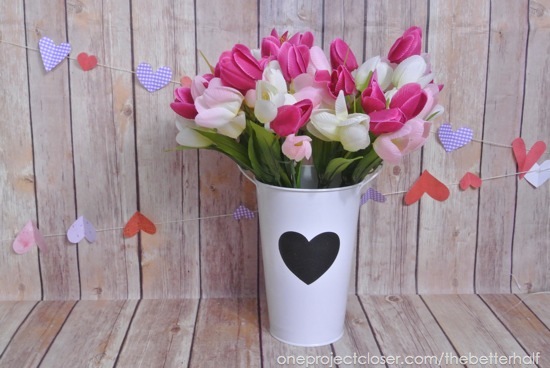 I love pallets and these are so pretty and cheery! This is just beautiful!!!! I love it! All of your projects are fabulous! 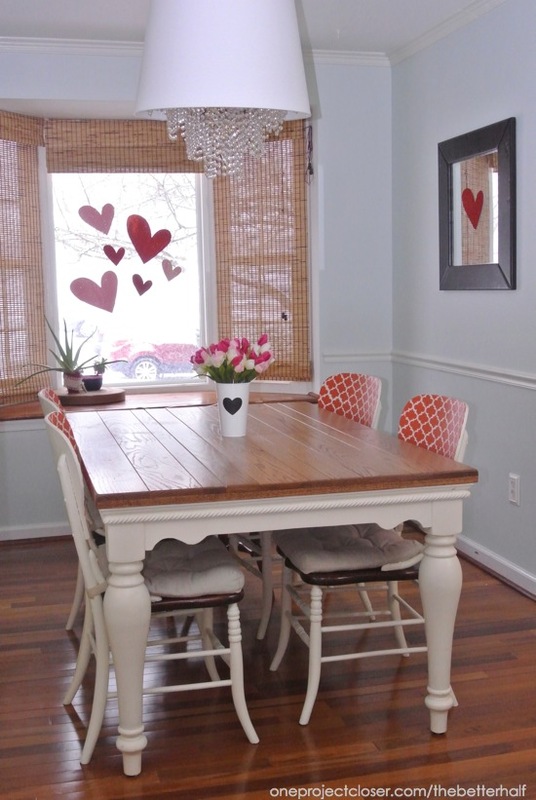 I can’t take my eyes off of your dining room farm table – I want one so bad!! Adorable projects! 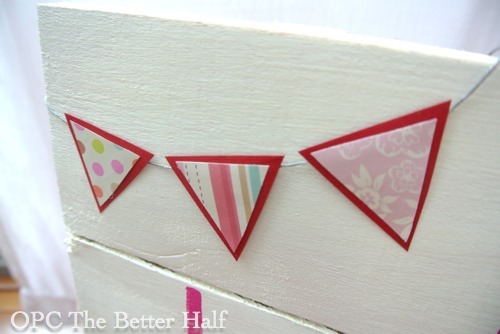 I love all the bunting!